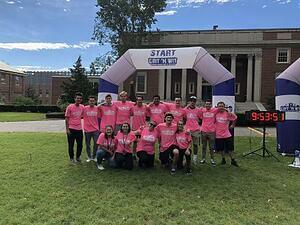 Another Beautiful day for Grit ‘N Wit at the First Annual Grit ‘N Wit Challenge at Wheaton College! We had a blast being a part of Wheaton’s parents weekend as brothers, sisters, parents, grandparents, staff and even President Hanno competed along with the students! All of this was possible thanks to a great group of volunteers and a special thanks to Judy Allen for coordinating everything and putting on a great event! Not only was everyone helpful and organized…they were easy to find in their bright pink staff shirts, we were honored that we were gifted our own and proud to be honorary Lyons for a day! Great Volunteers helped put the WE in Wheaton!